Like all big cities, London must move with the times. It always has done, reinventing itself again and again in response to the changing needs of the businesses and people who've made the city their home. By the middle of the 20th century, however, the streets and skyline of London changed more significantly than at any other time since the Great Fire of 1666. This time it was not a careless Pudding Lane baker who was to blame for the destruction of London but the bombers of Nazi Germany. Although the Luftwaffe’s attacks on London — heaviest in 1940 and 1941 — failed to force Britain into capitulation, it destroyed over 1 million buildings, left 30,000 Londoners dead, and over 1.2 million homeless (out of the 2 million displaced across Britain, with many devastating air raids on other cities). After the Allied victory in 1945, the London authorities had difficult decisions to make: whether to repair, rebuild or redevelop? The task was huge, and many plans took decades to fulfil. Yet the devastation gave architects a rare chance to reinvent the city, reworking the ruins for a new function. From the iconic to the very humble, here are some of Londonist’s favourite buildings and locations that rose from the rubble to receive a second chance from the developers. The church of St John’s Horsleydown was built between 1727 and 1733 following the 1710 Act of Parliament to build new churches in the London urban area. It served the people of Bermondsey for over 200 years before being severely damaged in a raid of 20 September 1940. Part of the structure remained a place of worship after the war but it was eventually closed in 1968. 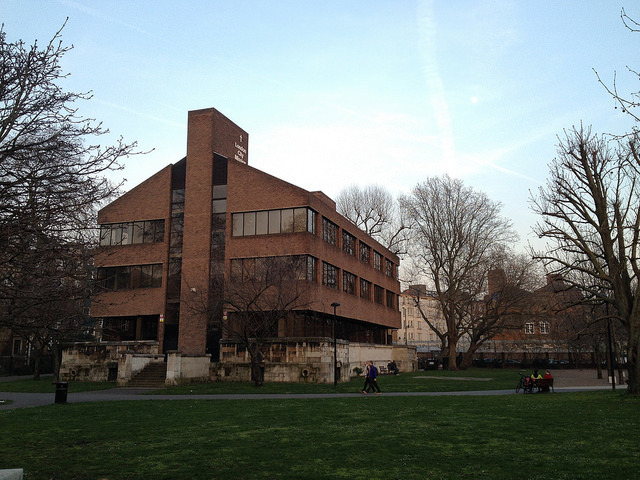 The church was demolished but the stone foundations remained in place to form the base of Nasmith House, which opened in 1975 as the new headquarters for the London City Mission who had lost their old headquarters during the Blitz. 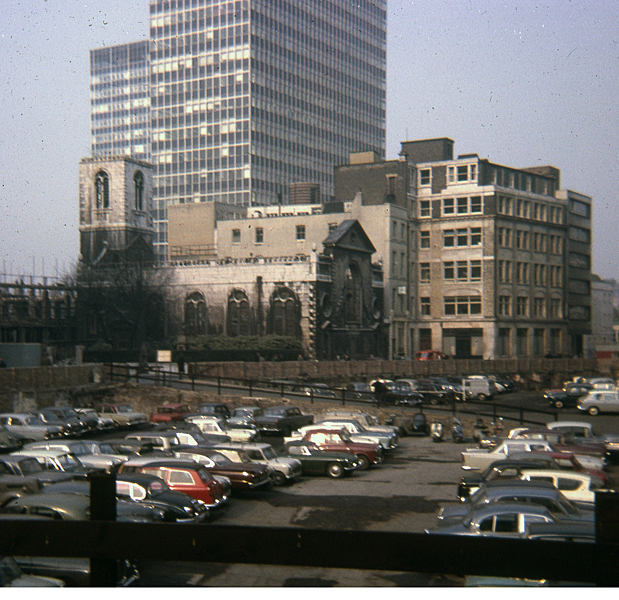 Image of St Giles and the surrounding Barbican by M@. St Giles-without-Cripplegate church is one of the few remaining pre-war structures that give any indication of the previous composition of the Cripplegate area. The totality of the destruction is illustrated by the grim fact that by 1951 only 48 people were recorded as living in this central London ward. The bold, futuristic Brutalist style of the residential estates, built between 1965 and 1976 by the architecture firm Chamberlin, Powell and Bon, might not be to everybody’s taste but the close proximity to the City and the perks of an on-site theatre, cinema, music hall and art gallery all under the Barbican Centre’s roof now make the Barbican one of London’s most desirable, and expensive, places to live. Image by Ronald Hackston in the Londonist Flickr pool. 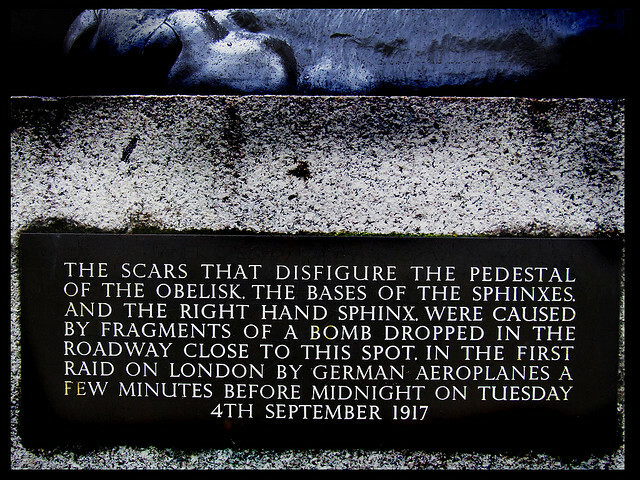 While the Blitz is well documented, it is sometimes forgotten that enemy attacks on London also occurred during the First World War. The 3,500 year old Egyptian obelisk, popularly called ‘Cleopatra’s Needle’, survived a perilous journey from Alexandria to be placed on the north embankment in 1878. It nearly fell victim to a German air raid on the night of 4 September 1917. Luckily the ancient obelisk was spared from a direct hit but one of the bronze sphinx figures below the monument was hit by flying shrapnel. It's pedestal still bears the scars. 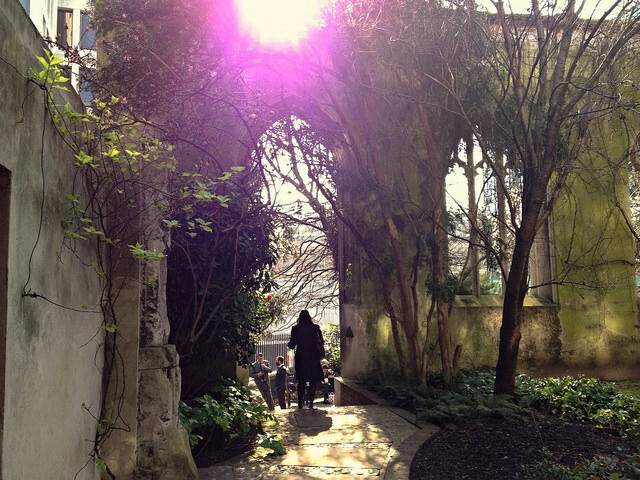 Since around 1100, the church of St Dunstan-in-the-East had stood a few minutes’ walk from the Tower of London. It was completely rebuilt after the Great Fire of London. On 10 May 1941, however, the ancient church went up in flames during a Luftwaffe air-raid. The main building was reduced to a burnt shell but the beautiful gothic steeple designed by Christopher Wren survived the bombing intact. 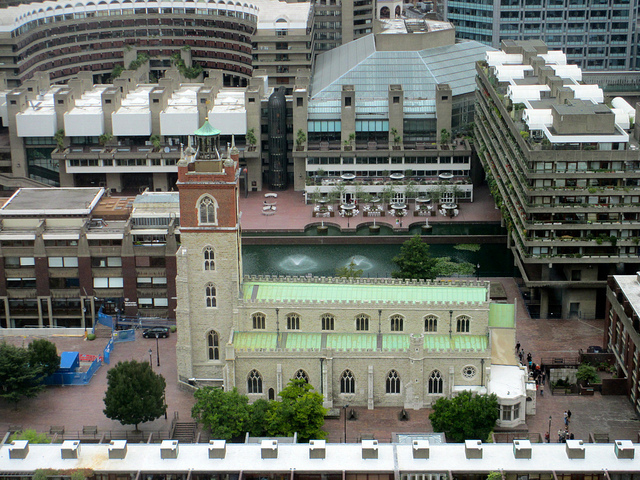 After it was decided that the church would not be rebuilt The City of London Corporation decided to convert the site into a public garden. Since opening in 1971, this well-kept park has provided office workers with a beautiful space to escape the daily-grind. The footprint of former homes and streets can still be seen in aerial views of Shoreditch Park. Image from Google Earth. If you search for Shoreditch Park on the digitalised map of Charles Booth’s 1898-99 Poor Map of London, you will see a distinct lack of green public space north of Old Street. A maze of Victorian terraces fills the border of the old parishes of Christ Church Hoxton and St Saviour Hoxton. The online Bombsight archive that records the location of all London bombings confirms that between 7 October 1940 and 6 June 1941 no less than five highly-explosive devices were dropped in the north-west corner of the area, obliterating the terraced streets. In the immediate years after the war, this levelled wasteland was the ideal location for the much-needed prefab bungalows that housed many of London’s homeless, and it was not until the 1970s that the site was developed into a park. However, the foundations of the terrace formation can still be recognised in aerial images of the north-west corner of the park. Fragment of the old House of Commons, by M@. Twice in its history, the Commons Chamber has been sacrificed to save the 11th century Westminster Hall from the ravages of fire. Charles Barry's grand design for the Palace of Westminster after the great 1835 fire saw the new House of Commons completed in 1852 and finished with ornate Gothic-Revival detailing by Augustus Pugin. The Chamber failed to reach its centenary, however, following an incendiary attack on the nights of 10 and 11 May 1941. MPs took temporary residence in the Lords Chamber while the gutted shell of the Commons was rebuilt by John Mowlem & Co architects under the guidance of Giles Gilbert Scott. The sympathetic but simplified version of the original chamber was formally opened by George VI in October 1950 and remains an iconic backdrop to the British political process. 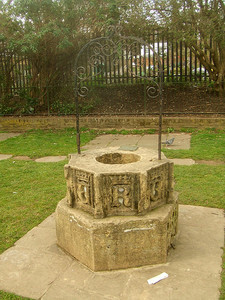 You can still see a fragment of the old chamber in Antrim Park, Belsize Park. 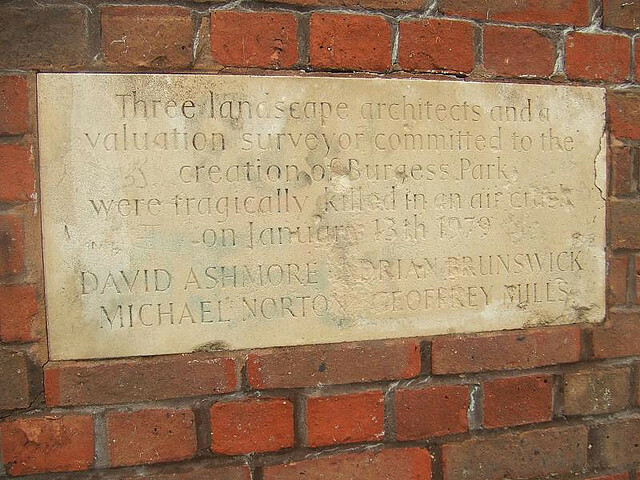 A plaque in Burgess Park, showing another aspect of the area's history of tragedy. Image by M@. Between the busy Old Kent Road and Camberwell Road, Burgess Park is one of the biggest open spaces in inner south London. The vast sports fields and large ornamental ponds are a relatively recent arrival, and the land was formerly covered in an urban sprawl of housing and industrial buildings. The idea of establishing a park from an existing urban area came from the 1943 Abercrombie Plan. This plan considered the reconstruction of post-war London while suggesting solutions to existing issues of city living such as traffic congestion, substandard housing and the need for more open spaces. Many of the industrial sites in this area had been severely damaged in air raids, but the plan was highly contentious as it also meant demolishing residential properties that had survived the war intact. The area officially became Burgess Park in 1973, and the former Grand Surrey Canal became a bike path stretching the length of the park. Remnants of the streets and buildings that once occupied the site remain, including a lime kiln, almshouses, public baths and a library, all of which hint to the park’s previous existence. Image by David Crausby in the Londonist Flickr pool. While most of the buildings on this list changed significantly following the destruction of war, The Tate Gallery (as it was then known) got off pretty lightly, but not completely scot-free. The grand Millbank building, which first opened in 1897, received damage to the roof and offices by a high-explosive bomb on 16 September 1940, and was hit again on 19 December 1940 by two incendiary bombs, which set fire to the roof and floorboards of the gallery. 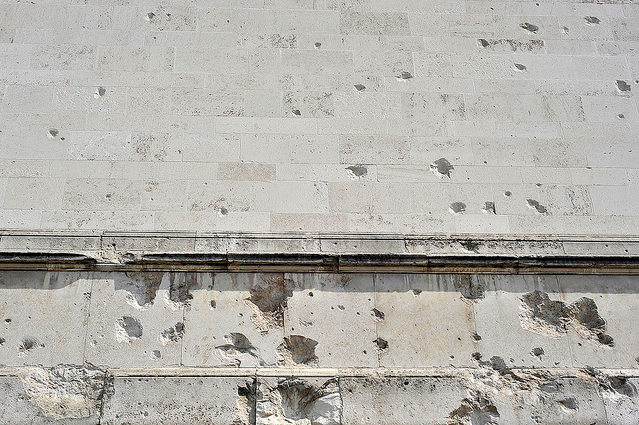 The artworks, put into storage at the start of the war, remained safe, but the pockmarked wall at the Atterbury Street gallery entrance still bears the scars of shrapnel. As one of the most iconic buildings in London, Buckingham Palace was bound to be a key target during the Luftwaffe’s campaign to destroy British morale as well as British buildings. One of the nine direct hits that the palace experienced occurred on the night of the 13 September 1940, destroying the royal family’s private chapel as well as killing one worker and injuring three others. 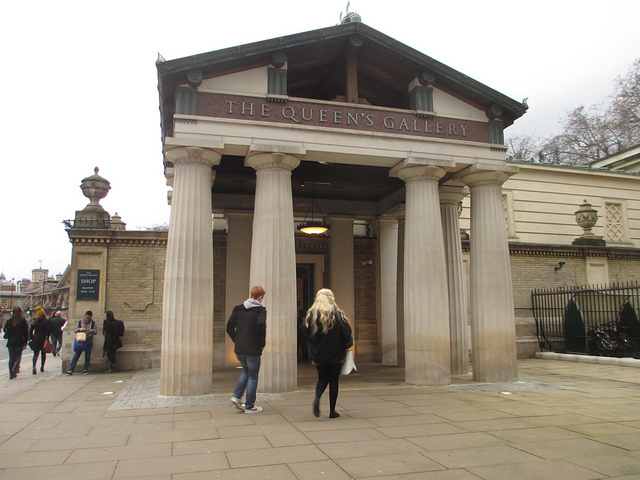 It was not until 1962 that the bombed chapel site was redeveloped into a new public art gallery, which continues to display a wide selection of the royal art collection from the past 500 years. View of the bombed out church by David Swindell under Creative Commons licence. A stone’s throw from the Guildhall, St Mary Aldermanbury Gardens is another example of a bombed church site repurposed into a green space within the city. A church was first recorded on this site in 1181 and rebuilt after the Great Fire of London by Christopher Wren. The external walls were the only remaining features of the church after it was firebombed in 1940; however, the only significant structure in the garden today is a bust of William Shakespeare. If you want to see the surviving stones of the church you’ll have to visit the grounds of Westminster College in Fulton, Missouri, where they were incorporated into a replica of St Mary Aldermanbury in 1966. Built as memorial to Winston Churchill, who made his seminal Iron Curtain speech while visiting the college in 1946, the rebuilding of a bombed Wren church to its former glory was a symbol of peace but also a bold gesture of solidarity between Great Britain and the United States just as the Cold War started to intensify. Obviously, we're barely scratching the rubble with this overview. Thousands of other sites were bombed and many have interesting stories. Please do share your own discoveries in the comments below.